The Metal Gear Solid director said he would love to write a story with similar topics to the hit TV show, but it would be hard to get approval for it as a video game. Apparently, the man behind Solid Snake wishes he had also thought of Walter White. In a lengthy interview with Game Informer that touched upon a wide variety of topics, Hideo Kojima said that he had recently started watching Breaking Bad, and while he's impressed with what he's seen he said he can't help but feel envious. "I was very pissed off, because I wasn't the one to think of that story. That depressed me," he said. 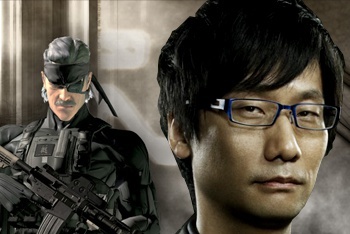 Kojima, who said he just got through the show's second season, said his feelings come in part from the fact that it would be very difficult to deal with the show's themes in his own medium. "The kind of topics they're handling in Breaking Bad, the way they express them and put them on screen, let's say I tried to create a game with similar topics and similar expressions, it would be hard to get approval in the company. The way these guys are putting the planning for this project and making it a commercial success - that's somewhere I feel very jealous as a creator." Kojima also praised Alfonso Cuaron's recent movie Gravity, calling it a similar story that would be hard to get approved at his video game company. "Making something out of the ordinary, that you wouldn't think of or be able to do, and making that happen while making it a success. That's something that I can empathize with and I'm also very jealous of it as a creator," he told Game Informer. The interview also touches upon story and gameplay information for the upcoming Metal Gear Solid V: The Phantom Pain and Metal Gear Solid: Ground Zeroes. Kojima said that the map for The Phantom Pain will be roughly 200 times larger than that of Ground Zeroes, and include multiple bases and outlying areas. Ground Zeroes, meanwhile, is limited to a small island. One story from the interview that could have used more elaboration was Kojima's brief mention of his friendship with director Guillermo Del Toro. How did the Metal Gear creator and Pacific Rim director most recently spend their time together? By singing anime songs together at a karaoke night. Kojima said he would love to work together with Del Toro on a project some day.